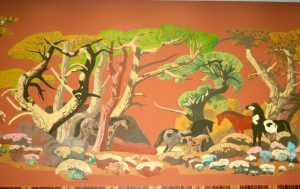 Calling All Photos of Lost Sheets & Associates Bank Artwork! Soon after the handover of Washington Mutual to Chase, Tony Sheets, Millard’s son, walked into the West Portal branch of the bank in San Francisco. 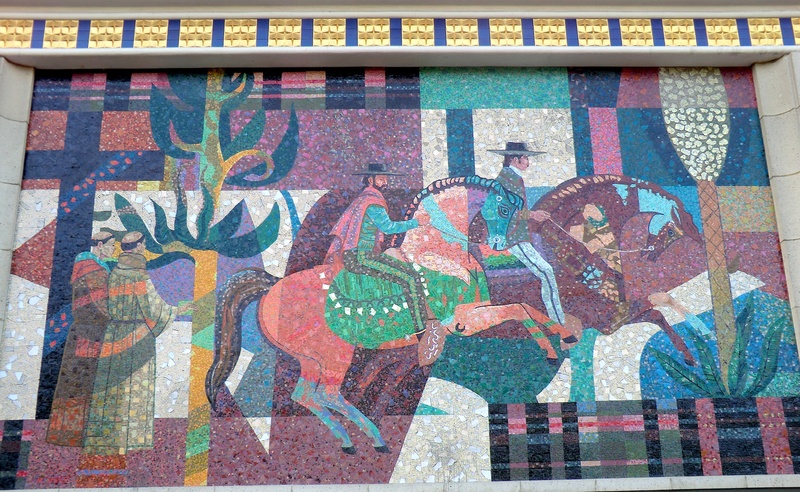 After seeing the mosaic outside, showing the international reach of San Francisco’s trade, Tony proceeded inside and—found the interior mural painted over. Now, the Home Savings banks saw a lot of remodeling between their construction and the present day—and, as we have seen, changes occurred under the management of Home Savings and Washington Mutual as well as Chase. But given the greater press for uniformity from Chase, their efforts to paint walls white and put up Plexiglas shields has led to the greater threat to this artwork. Finally, Tony Sheets and Chase have been working together to save more of this artwork – but that doesn’t tell us what has been lost. Mural painting, West Portal; lost? 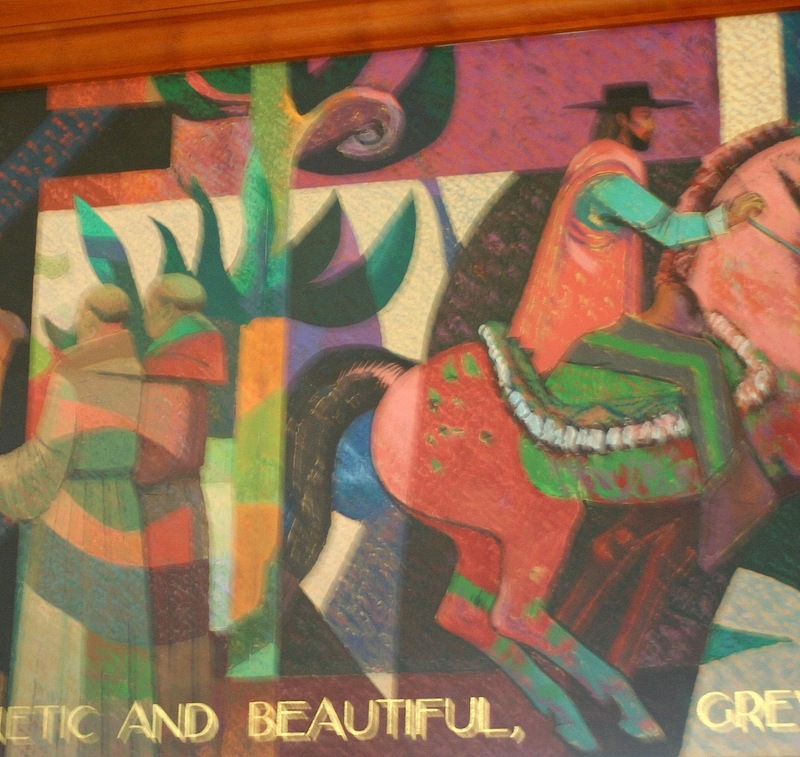 The image above is from the corner of the West Portal mural, a casual shot I took back in August 2007. To the right is another painted mural from that branch, at the time; perhaps a local can tell me if it is gone as well. But more than the specifics of these lost paintings, I want to use this as a general call for images of lost artwork—or, if you are not sure if the Home Savings artwork you pictured is lost, of all interior shots from these banks. 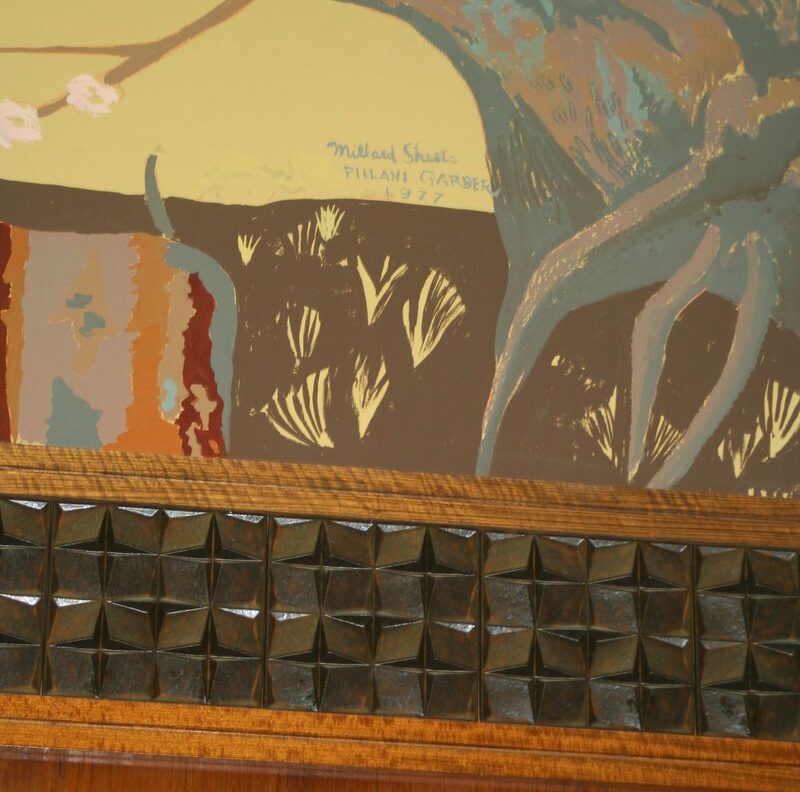 Brian Worley, who worked in the studio in the 1970s, got into the habit of taking installation shots of the mosaics, so we have an excellent record of the exterior artwork, from the first banks until the last mosaics completed. 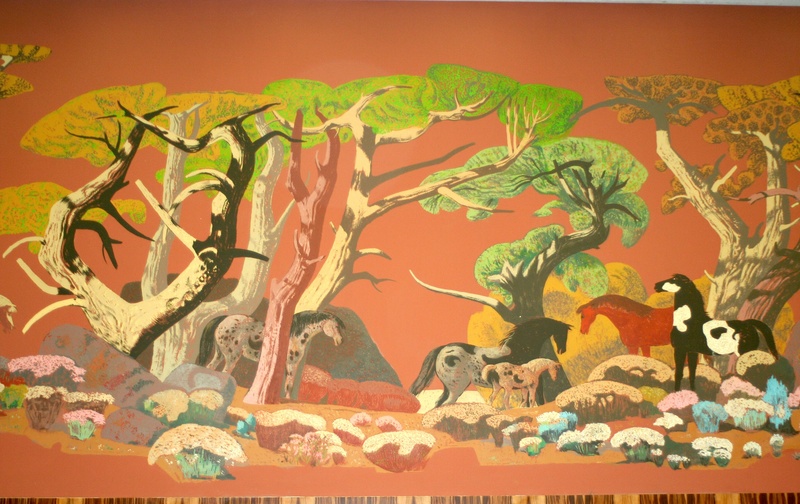 But, as he noted, “the painted murals were, as I remember it, installed later than the mosaic murals…The seams always needed to be touched up and that was done by Sue [Hertel], so I would have needed to go back later specifically to take pictures and was rarely if ever tasked with doing that. Same with the stained glass.” So the exteriors have a record; the interiors, less so. Can you show us the lost artwork of Home Savings? As I mentioned last week, memories of my “home branch” in La Mesa are what motivated me to start this project. And I thought that all of the Home Savings branches held historic images, like this, showing the California past. Well, last week’s whales, on the same branch, could have been my first clue that the larger study would do in a different direction. But I was still convinced that each branch received its own community-appropriate images, reflecting the specifics of local history and the local community. Then I found these exact horsemen in the Lombard branch mural in San Francisco, and I could see how, when there were a lot of commissions due, the Sheets Studio could cut a few corners by duplicating the design. 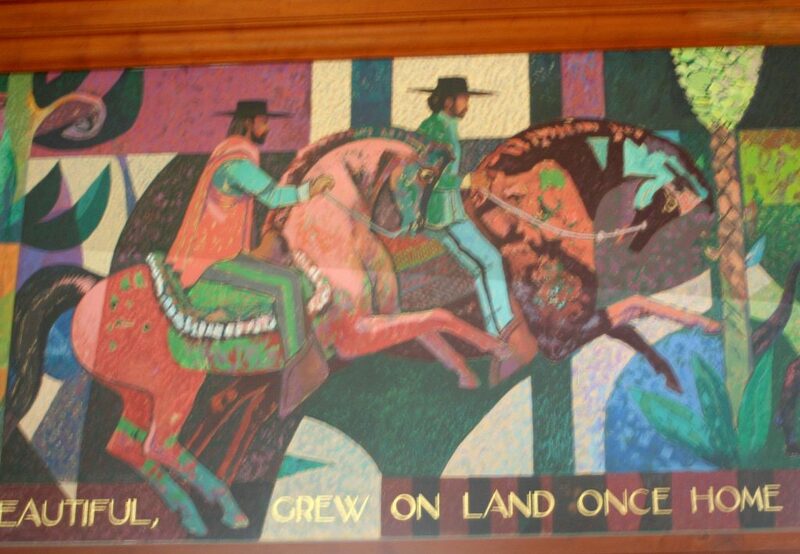 Now, I still like the design, and I think that a portrayal of Californio horsemen (whatever the exact reference — the history throughout, I have learned, profits from vague referents) can fit for both locales and stories, showing the Spanish settlement of California. 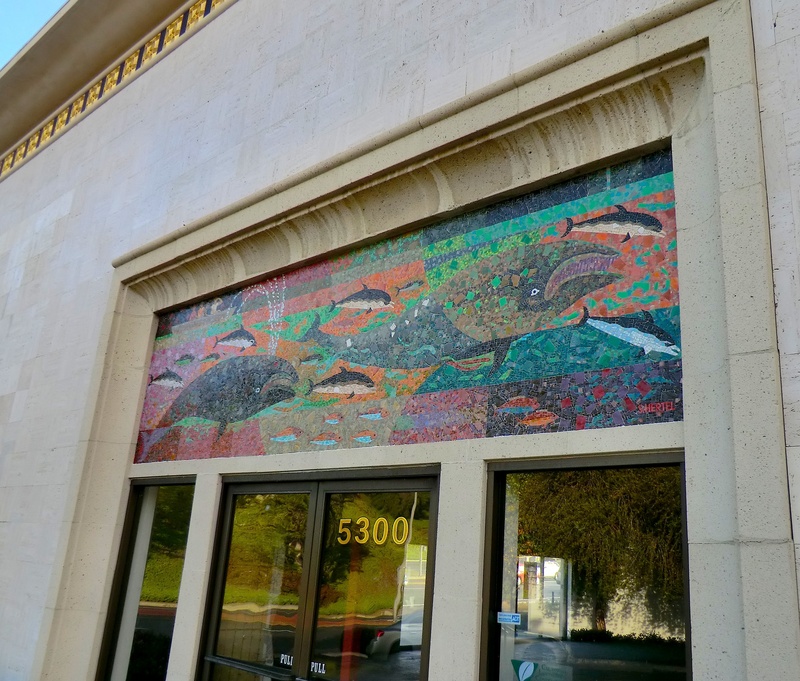 The Lombard branch has a tremendous amount of art — a wraparound mural; stained glass; and a sophisticated look at the waterfront and how different cultures have used the San Francisco Bay — artwork intended for another branch in the area and moved to the Lombard exterior at the last minute. Style is built of repeated elements (media, colors, topics), of course, and Home Savings sought a narrow enough range to make the banks instantly identifiable. And before the Internet age it was unlikely that viewers would have both of these images together. But this is the most blatant repeat I have found; not just themes (as this shares with Laurel Canyon, for example) but the same figures, down to the colors of the saddles. The Franciscan friars (and the trees, front and back! and the background squares!) are there in both, too, marking how the missions opened up the possibility of ranching and other agricultural settlement among (or in place of) the Native Americans of the region. Are you aware of other exact copies, either of these figures or other Sheets Studio motifs? I will seek them out, as I continue my survey of the locations. Sue Hertel, Whales, La Mesa/Grossmont, 1976. Photo courtesy of Andrea Flint-Gogek, 2010. Happy Birthday, blog! Hard to believe, but one year ago, I put up the first list of these Home Savings banks, in my effort to draw attention to their history and to fight for their preservation. A year later, I am gratified by the thousands of site visitors, and the contact from those who created the artwork, worked for Home Savings, lived with the artists, or simply always admired the Home Savings art and architecture. I have now conceived of a whole book project on this artwork, and 2011 is the year I can comprehensively research this art and argue more for its larger meaning. In the meantime, I am back to the school year, teaching in Texas and having (at times quixotic) conversations with Chase Bank employees, many of whom know nothing about the artwork around them. But, as today’s post shows, at least use as marquee banks by Chase can offer some security for the banks. This is my “home” branch, near the Grossmont Mall in La Mesa, just over the line from the neighborhood of San Diego where I grew up. The large horses on the front (come back next week) and this pod of whales is what stuck with me, making me want to do this project someday. Hertel, La Mesa whale detail. Photo courtesy Andrea Flint-Gogek. As you can see, the whales are signed by Sue Hertel, and something about those spouts always struck me as funny — these are whales having a good time, even just over a parking-lot door, far inland. They were completed in 1976, just as burst of Home Savings banks were opening, all over California. And the Buffums department store used to anchor that Grossmont Mall, and my babysitter at the time (an Italian grandmother) used to take me to Buffums for lunch as a special outing. She has passed away, and so has Buffums, and perhaps the place I went to driving school, up on the other mesa. And so has Home Savings, and so has Washington Mutual, who sold this branch in 1998. And so has the barbeques store that once was here. As reader Andrea Flint-Gogek so kindly shows us in these recent pictures, the former bank is empty. So if you would love a classy location for your La Mesa business here it is! Save the whales! And if you are the owner and ever think of tearing it down, I can give you a list of museums that would be happy to pay the costs to remove such important mosaics from the buildings.